A Grenada honeymoon offers newlyweds the quintessential laid-back Caribbean experience, and plenty of quiet beaches a bit off the beaten path. A Grenada honeymoon is imbibed with Caribbean culture. Everywhere you turn there are colorful buildings, soft, sandy beaches and green hillsides with spice plantations and a wealth of tropical fruit trees. 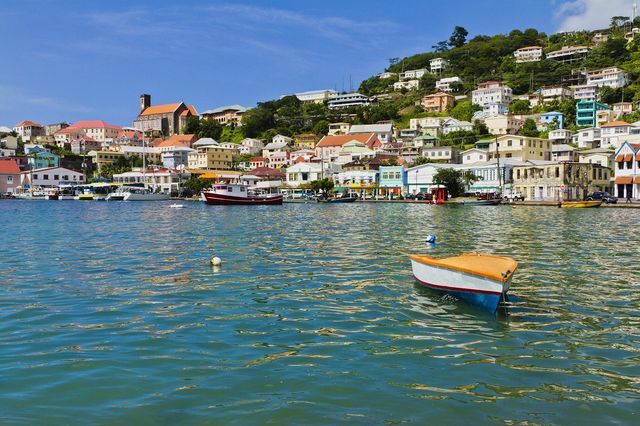 St. George’s is one of the Caribbean’s prettiest capitals with it’s colorful harbor and streets full of quaint shops and cafes. If you are looking for an all-inclusive resort experience, you won’t find it here. Tourism isn’t as developed as many of the Caribbean hotspots. As such, the beaches tend to be quiet which is ideal for those who are looking for a romantic getaway. Outside of relaxing on the beaches, hiking the islands rainforests and enjoying its waterfalls are a must-do, as is shopping in the market and snorkeling or scuba diving just off the island’s coast. You'll love all that a Grenada honeymoon has to offer, from relaxation to adventure and more. Late fall offers the sweet spot of good rates and nice weather for a Grenada honeymoon. January and April are the most popular and most expensive time to go and September and October are the worst months to visit as it is the height of hurricane season. Grenada National Museum A museum in St. George’s with exhibits related to history, nature and ethnography of the island. Grenada Underwater Sculpture Park A popular site for snorkeling and scuba diving with a collection of underwater sculptures—definitely a must-visit during a Grenada honeymoon. Laura’s Herb & Spice Garden A beautiful herb garden with guided tours and tastings. Grand Etang Lake A volcanic crater lake surrounded by lush jungle, with hiking trials waterfalls, wildlife and guided tours. Grand Anse Beach A white sand beach with stunning turquoise water in sight of the capital city and hillsides nearby. Belmont Estate A working plantation that offers tours of the grounds and production facilities and has a small museum and restaurant. Pink Gin Beach An upbeat beach with clear, calm water, beautiful sand, water sports and seaside dining. Levera National Park A large park with a number of different habitats including mangrove swamps and beautiful beaches. Fort George A 18th century French fortress built on a hillside. Views of the city and harbor from the top reached by a steep hike. Annandale Falls A beautiful waterfall with a small pool at the bottom where many choose to swim accessed by a short hiking path. BBC Beach A beautiful beach with shaded areas and a number of bouncy inflatables out on the water. Mount Qua Qua Popular mountain with a beautiful view from the peak. The climb to the top is a strenuous 2.5 hours both ways—only for the most adventurous Grenada honeymooners. Mount Saint Catherine Grenada’s tallest mountain with two, somewhat strenuous trails leading to the crater at the top. La Sagesse Bay A secluded, romantic beach on the island’s east coast.